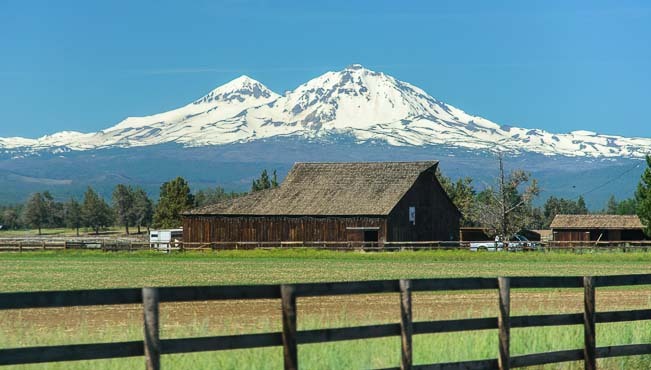 June, 2014 – Oregon is loaded with designated Scenic Drives, and a lot of these routes weave a web around central Oregon. During our stay in Bend, cruising friends of ours who were on a brief break from sailing the South Pacific on their boat Mazu invited us to visit. 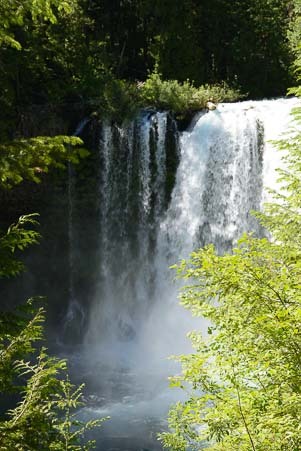 This was a perfect chance for us to check out the scenic roads along the McKenzie River that lie to the west of Bend. As we approached the cute town of Sisters we were awarded with some spectacular views of snowcapped mountains hovering on the horizon. These mountains are the Three Sisters, bearing the names Faith, Hope and Charity. 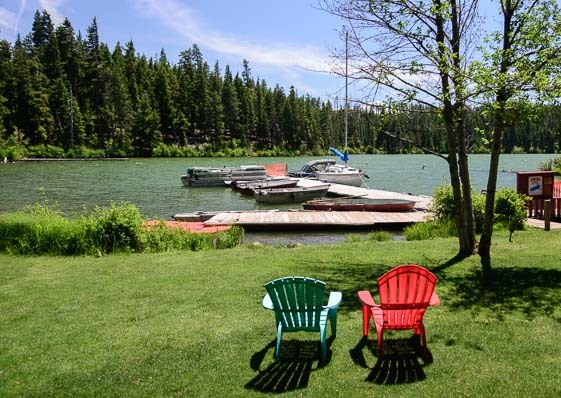 They sit a tantalizing but frustrating distance away from the very lonely yet handsome Mount Bachelor who has been trying unsuccessfully to win their affections forever. 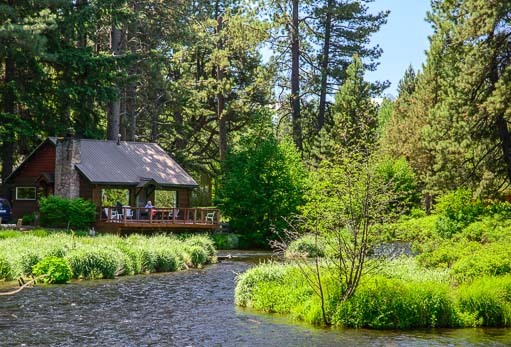 Our drive along the pretty McKenzie River took us first to Camp Sherman, a tiny and richly verdant village on the banks of the small Metolius River. Just a few miles from Camp Sherman we visited the headwaters of the Metolius River which spill forth from the side of a hill like a huge bubbler. The scientific debate about the origins of this water is intriguing in an academic kind of way, and we nodded with appropriate solemnity as we read the plaques about it all. 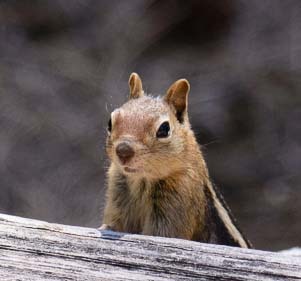 But what really captivated us at the viewing area were the chipmunks. 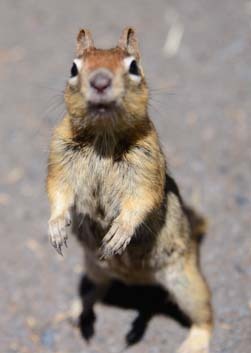 These cheeky little guys are very fond of people and they ran right up to us. Well, “fond of people” isn’t quite accurate, as it is the snacks we people carry that they are after! They sized us up in a heartbeat, and quickly wrote us off as being uselessly empty-handed and soon disappeared. A little further west on our drive along Route 126 we stopped at Suttle Lake where we wandered among the flowers and took in the lake views. 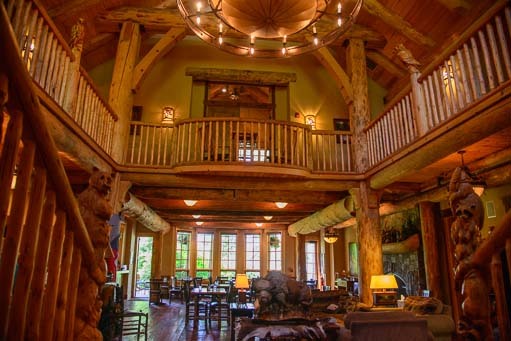 The Lodge at Suttle Lake is a beautiful log structure with a huge and inviting great room that boasts a big stone hearth. The lodge was spacious and airy yet cozy at the same time. 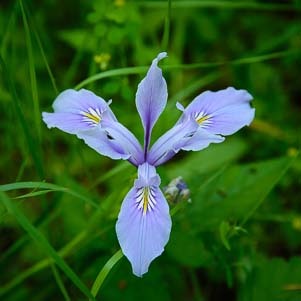 Mark found this beautiful wildflower. 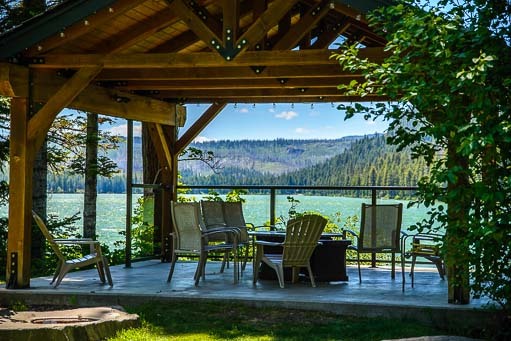 Out on the raised lawn there is an elegant deck with patio seating that overlooks the lake. 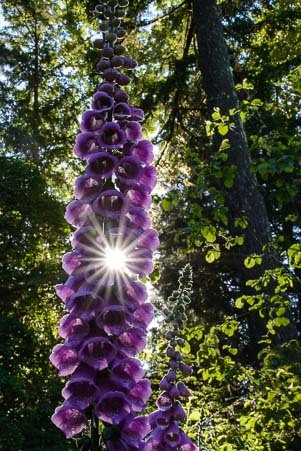 Mark spent quite a bit of time among the flowers and came away with some magnificent photos. Leaving Suttle Lake and carrying on our explorations further west, we came to Sahalie Falls. A stream-side hike at Sahalie Falls brought us to this view. Oregon is known for its stunning and varied waterfalls, but Sahalie Falls will always stand out in our memories as particularly majestic. We heard the big cascade from the parking lot before we even saw it, and as we descended the stone stairs on the path, a blast of cold air swept across us. The stairs are lined with hewn log rails that are covered so thickly in moss and ivy that they are a rich, moist dark green that is alive to the touch. At the bottom of the stairs a wonderful rainforest hiking trail winds over roots and between ferns along the river’s edge. Here the falls rush along in splashy, noisy rapids that tumble and crash over the rocks in a big rush to get downstream. 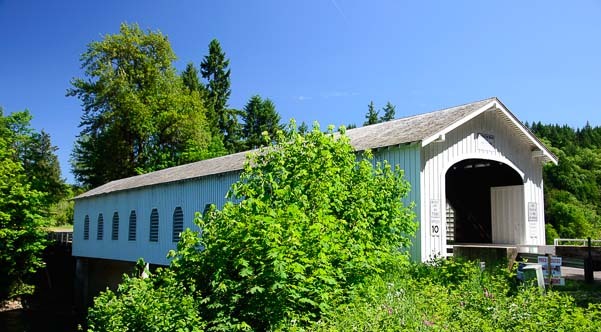 Good Pasture Covered Bridge is the longest continually used covered bridge in Oregon! Hopping back in the truck, Route 126 took us further west along the McKenzie River, passing by the historic Good Pasture Bridge. 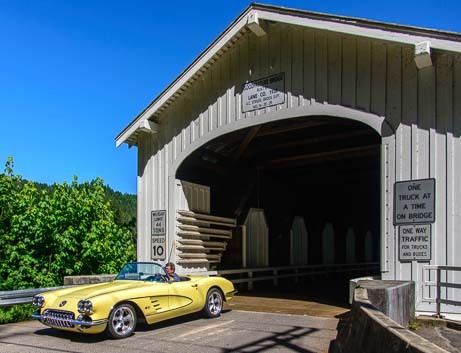 This covered bridge is the second longest in Oregon, and the longest one that has been in continual use since it was built. We learned that, back in the day, bridges were built with walls and a roof so horses would walk across without shying. And here comes a 1959 Corvette! How fun to watch a pristine 1959 Corvette convertible come through the bridge towards us! Our friends took us to the Leaburg fish hatchery where trout and other fish are raised to stock the area rivers and lakes. 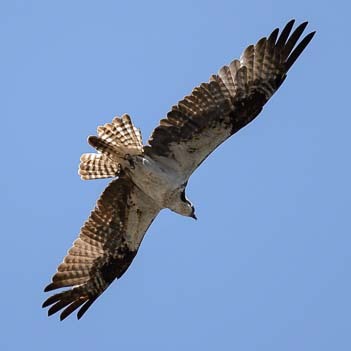 Seeing the jumble of fish in the water was interesting, but the best part was when an osprey silently swooped down and grabbed a fish out of a tank in its talons. There’s nothing like a free lunch! He took his catch up in a tree to enjoy lunch with a view! Two routes cross the Cascades west of Bend, the Santiam Pass (Route 126) we had just driven and the McKenzie Pass (Route 280) we had not yet seen. For one month each spring the McKenzie Pass Scenic Byway is opened strictly to bicycle traffic. We hit it with our mountain bikes on the last day that bikes ruled the road. see a guy doing it on a unicycle!! After a long grind to the top and a screaming descent back down to the bottom, we noticed a fellow doing the ride on a unicycle. This wasn’t his first time either. He told us he’d ridden to the summit on his unicycle each weekend since the route opened to bikes four weeks earlier. 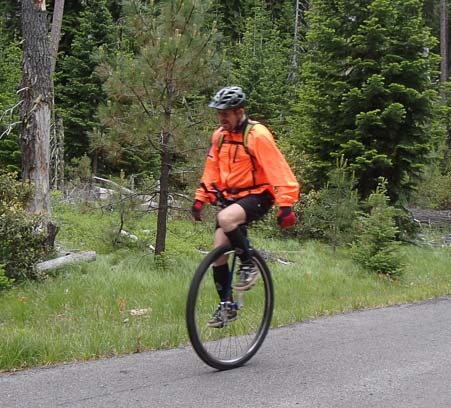 What’s more, he was part of a unicycling mountain bike club. 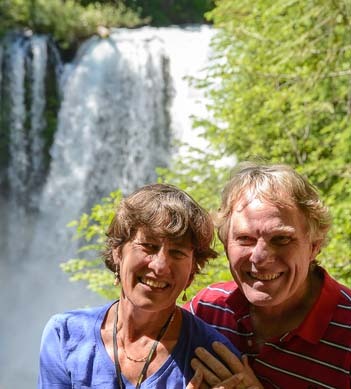 And here we’d been patting ourselves on the back for conquering McKenzie Pass and romping around the area’s mountain biking trails on our two wheeled bikes. 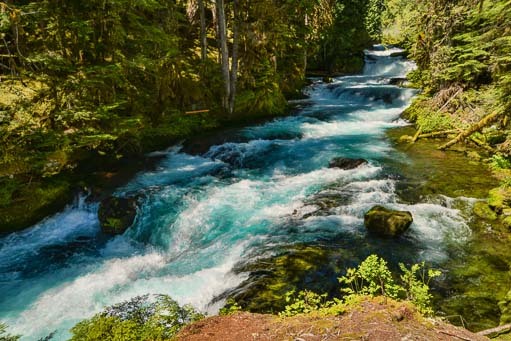 Without a doubt, the area around Bend, Oregon, was continuing to impress us with its gorgeous rivers, streams and lakes and its vigorous and irreverent spirit! This entry was posted in Oregon and tagged New, Oregon, Travel, USA, WP Travel by Roads Less Traveled. Bookmark the permalink.